Ben Nevis - the highest mountain in Britain - occasionally experiences periods at its summit when the air is bone dry. Image copyright Philip Brohan, UK Met Office (Compo et al, 2011). "These men on Ben Nevis were really puzzled why, for a couple of days, the air would be as dry as it could be, when most of the time they would be living inside a cloud and 100% humidity!" said Prof Ed Hawkins from Reading University. "Today, we recognise that dry air can sometimes descend from the stratosphere to near the surface in high pressure systems. So, while it was a mystery for them, we can now go back and reanalyse their data to see these events unfold and explain them." The famous "Weathermen of Ben Nevis" would take measurements of temperature, pressure and humidity on the hour, every hour. Quite a challenge in the worst of winters. And in that sense the men's dedication paid dividends, even if they didn't always fully comprehend what their instruments were observing. "There is only a single reliably documented instance of a humidity below 10%, far less approaching zero, at any lowland site in the British Isles," he told BBC News. "At RAF Honington in Suffolk, the humidity fell to 8% at 1400 GMT on 30 June 1976, during that summer's intense heatwave. In contrast, the Ben Nevis Observatory recorded values of 10% or less on 368 hours in 21 years 1883-1904, an average of 17 hours every year." Citizen scientists have managed to digitise nearly all of the weathermen's observations, which were kept in bound volumes after their operation was closed down. Professional researchers are using some of this information to reconstruct major events, such as the destructive 1903 "Ulysses storm", so-called because it was mentioned in James Joyce's classic novel. Just last week, which was British Science Week, there was a big push for volunteers to help convert the Met Office's "Daily Weather Reports" from 1861 to 1865. Prof Hawkins said: "As an example of why we are doing this: there was a severe flooding event near Leeds in November 1866 which this rescued data will help us better understand. That event was only beaten by the remarkable events of December 2015 which occurred in a very different concrete landscape." "My greatest value in revisiting the Ben Nevis observations? 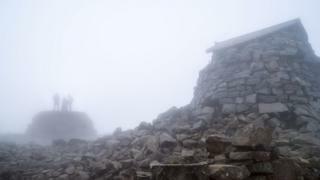 Seeing the records made on the summit, in often incredibly hazardous and inclement circumstances, made available to modern science at last," he told BBC News. "State-of-the-art instruments, dedicated observers, very high-quality published records and now 3,500+ crowd-sourced volunteers have given us the ultimate mountain weather record, one that will prove to be of immense benefit to all sorts of applications in the coming years."